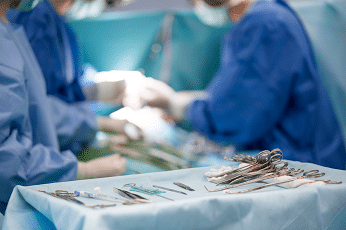 Surgical Instruments Left Inside Patients | Simmons and Fletcher, P.C. There are obvious dangers associated with this kind of medical malpractice. From perforated organs to serious infections, if you or someone you love has been injured due to a surgeon leaving a surgical instrument or sponge in the body, call 800-298-0111 for a free case evaluation. With the protocols set in place by hospitals and the standards required by surgeons, this kind of medical malpractice should never occur. In most cases, foreign objects are discovered soon after the patient has undergone surgery; however, this usually required additional surgery to correct which presents a new set of unnecessary complications the patient must be exposed to. The accepted medical standard for hospitals is to have protocols in place requiring the count of all instruments and sponges before surgery begins and ends. If you wind up with fewer at the end, you know a mistake was made that needs to be corrected right then and there. Advances in medical technology has also made identifying these materials easier. Most objects have a blue thread or tab that can be seen on an x-ray, making it easy to remove before the patient is closed up. So a simple post-op x-ray can confirm that the no objects were left in the patient. Medical sponges are the most common medical device that is inadvertently left inside patients. Scalpels, needles and gauze are then next most frequent medical devices left behind. Sponges are commonly overlooked because when used to clot blood in patients, they resemble the bodily tissue they are surrounded by. Softer medical objects like sponge and gauze, make patients more prone to infection. While sharp objects like scalpels and needles can perforate organs and have a more immediate effect on the body. These conditions can be dangerous, even deadly if allowed to go untreated. If you suspect a surgical object may have been left inside you, you should go to the emergency room and get checked out immediately. If you are experiencing these symptoms following a surgery, consult your medical provider immediately. Surgeries are complicated by nature, but your recovery process should not always be this way. If proper procedures are in place and protocol is followed, retained foreign objects simply should NEVER happen. If you or someone you love is dealing with complications associated with a retained surgical instrument, do not handle it alone. At Simmons and Fletcher, P.C., our attorneys have been serving injured victims in Texas since 1979. Don’t try to handle a medical malpractice claim by yourself, call 800-298-0111 to learn more about your rights.